DUBAI, United Arab Emirates (AP) — Roger Federer’s latest attempt to win his 100th ATP singles title made a shaky start at the Dubai Championships where he overcame Philipp Kohlschreiber 6-4, 3-6, 6-1 on Monday. Federer entered the first-round match with a 13-0 record against the German, and broke in the first game to run through the first set. But Kohlschreiber forced a third set between them for only the third time. 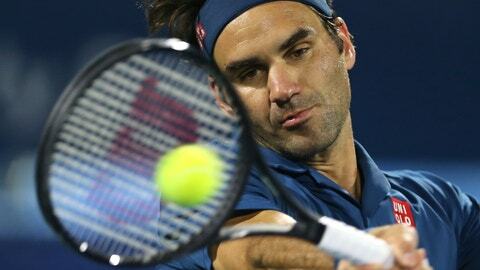 In that set, Federer forced an error to break for 2-0 and held, and cruised home. Federer won his 99th tour title in October in Basel, and his bid for the 100th has ended so far in two semifinals, then the fourth round of the Australian Open. Next up for him is Fernando Verdasco, the 2017 Dubai runner-up to Andy Murray. Verdasco beat Italian qualifier Thomas Fabbiano 3-6, 6-3, 6-2. The two other seeds in action beside Federer lost. Nikolaz Basilashvili, the highest-ranked Georgian in ATP history at No. 19, upset fourth-seeded Karen Khachanov of Russia 6-4, 6-1, and Jan-Lennard Struff of Germany spoiled seventh-seeded Milos Raonic’s Dubai debut 6-4, 5-7, 6-4. Basilashvili will play for a spot in the quarterfinals against defending champion Roberto Bautista Agut of Spain, who beat Indian wild card Ramkumar Ramanathan 6-4, 6-3.